This article is about optics and imaging systems. For angular resolution in graph drawing, see angular resolution (graph drawing). Angular resolution or spatial resolution describes the ability of any image-forming device such as an optical or radio telescope, a microscope, a camera, or an eye, to distinguish small details of an object, thereby making it a major determinant of image resolution. In physics and geosciences, the term spatial resolution refers to the precision of a measurement with respect to space. Resolving power is the ability of an imaging device to separate (i.e., to see as distinct) points of an object that are located at a small angular distance or it is the power of an optical instrument to separate far away objects, that are close together, into individual images. The term resolution or minimum resolvable distance is the minimum distance between distinguishable objects in an image, although the term is loosely used by many users of microscopes and telescopes to describe resolving power. In scientific analysis, in general, the term "resolution" is used to describe the precision with which any instrument measures and records (in an image or spectrum) any variable in the specimen or sample under study. Airy diffraction patterns generated by light from two point sources passing through a circular aperture, such as the pupil of the eye. Points far apart (top) or meeting the Rayleigh criterion (middle) can be distinguished. Points closer than the Rayleigh criterion (bottom) are difficult to distinguish. The imaging system's resolution can be limited either by aberration or by diffraction causing blurring of the image. These two phenomena have different origins and are unrelated. Aberrations can be explained by geometrical optics and can in principle be solved by increasing the optical quality — and consequently the cost — of the system. On the other hand, diffraction comes from the wave nature of light and is determined by the finite aperture of the optical elements. The lens' circular aperture is analogous to a two-dimensional version of the single-slit experiment. Light passing through the lens interferes with itself creating a ring-shape diffraction pattern, known as the Airy pattern, if the wavefront of the transmitted light is taken to be spherical or plane over the exit aperture. The interplay between diffraction and aberration can be characterised by the point spread function (PSF). The narrower the aperture of a lens the more likely the PSF is dominated by diffraction. In that case, the angular resolution of an optical system can be estimated (from the diameter of the aperture and the wavelength of the light) by the Rayleigh criterion defined by Lord Rayleigh: two point sources are regarded as just resolved when the principal diffraction maximum of one image coincides with the first minimum of the other. If the distance is greater, the two points are well resolved and if it is smaller, they are regarded as not resolved. Rayleigh defended this criteria on sources of equal strength. The formal Rayleigh criterion is close to the empirical resolution limit found earlier by the English astronomer W. R. Dawes who tested human observers on close binary stars of equal brightness. The result, θ = 4.56/D, with D in inches and θ in arcseconds is slightly narrower than calculated with the Rayleigh criterion: A calculation using Airy discs as point spread function shows that at Dawes' limit there is a 5% dip between the two maxima, whereas at Rayleigh's criterion there is a 26.3% dip. Modern image processing techniques including deconvolution of the point spread function allow resolution of binaries with even less angular separation. This is the size, in the imaging plane, of smallest object that the lens can resolve, and also the radius of the smallest spot to which a collimated beam of light can be focused. The size is proportional to wavelength, λ, and thus, for example, blue light can be focused to a smaller spot than red light. If the lens is focusing a beam of light with a finite extent (e.g., a laser beam), the value of D corresponds to the diameter of the light beam, not the lens. [Note 1] Since the spatial resolution is inversely proportional to D, this leads to the slightly surprising result that a wide beam of light may be focused to a smaller spot than a narrow one. This result is related to the Fourier properties of a lens. Log-log plot of aperture diameter vs angular resolution at the diffraction limit for various light wavelengths compared with various astronomical instruments. For example, the blue star shows that the Hubble Space Telescope is almost diffraction-limited in the visible spectrum at 0.1 arcsecs, whereas the red circle shows that the human eye should have a resolving power of 20 arcsecs in theory, though normally only 60 arcsecs. Point-like sources separated by an angle smaller than the angular resolution cannot be resolved. A single optical telescope may have an angular resolution less than one arcsecond, but astronomical seeing and other atmospheric effects make attaining this very hard. where λ is the wavelength of the observed radiation, and D is the diameter of the telescope's objective. The Resulting R is in radians. For example, in the case of yellow light with a wavelength of 580 nm, for a resolution of 0.1 arc second, we need D=1.2 m. Sources larger than the angular resolution are called extended sources or diffuse sources, and smaller sources are called point sources. This formula, for light with a wavelength of about 562 nm, is also called the Dawes' limit. The highest angular resolutions can be achieved by arrays of telescopes called astronomical interferometers: These instruments can achieve angular resolutions of 0.001 arcsecond at optical wavelengths, and much higher resolutions at x-ray wavelengths. In order to perform aperture synthesis imaging, a large number of telescopes are required laid out in a 2-dimensional arrangement with a dimensional precision better than a fraction (0.25x) of the required image resolution. where λ is the wavelength of the observed radiation, and B is the length of the maximum physical separation of the telescopes in the array, called the baseline. The resulting R is in radians. Sources larger than the angular resolution are called extended sources or diffuse sources, and smaller sources are called point sources. 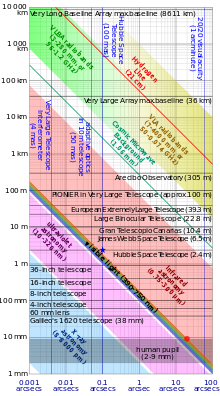 For example, in order to form an image in yellow light with a wavelength of 580 nm, for a resolution of 1 milli-arcsecond, we need telescopes laid out in an array that is 120 m × 120 m with a dimensional precision better than 145 nm. is the wavelength of light illuminating or emanating from (in the case of fluorescence microscopy) the sample. which is near 200 nm. Oil immersion objectives can have practical difficulties due to their shallow depth of field and extremely short working distance, which calls for the use of very thin (0.17 mm) cover slips, or, in an inverted microscope, thin glass-bottomed Petri dishes. However, resolution below this theoretical limit can be achieved using super-resolution microscopy. These include optical near-fields (Near-field scanning optical microscope) or a diffraction technique called 4Pi STED microscopy. Objects as small as 30 nm have been resolved with both techniques. In addition to this Photoactivated localization microscopy can resolve structures of that size, but is also able to give information in z-direction (3D). ^ In the case of laser beams, a Gaussian Optics analysis is more appropriate than the Rayleigh criterion, and may reveal a smaller diffraction-limited spot size than that indicated by the formula above. ^ Born, M.; Wolf, E. (1999). Principles of Optics. Cambridge University Press. p. 461. ISBN 0-521-64222-1. ^ a b Lord Rayleigh, F.R.S. (1879). "Investigations in optics, with special reference to the spectroscope". Philosophical Magazine. 5. 8 (49): 261–274. doi:10.1080/14786447908639684. ^ Michalet, X. (2006). "Using photon statistics to boost microscopy resolution". Proceedings of the National Academy of Sciences. 103 (13): 4797–4798. Bibcode:2006PNAS..103.4797M. doi:10.1073/pnas.0600808103. PMC 1458746. PMID 16549771. ^ "Diffraction: Fraunhofer Diffraction at a Circular Aperture" (PDF). Melles Griot Optics Guide. Melles Griot. 2002. Archived from the original (PDF) on 2011-07-08. Retrieved 2011-07-04. ^ Davidson, M. W. "Resolution". Nikon’s MicroscopyU. Nikon. Retrieved 2017-02-01. ^ Pohl, D. W.; Denk, W.; Lanz, M. (1984). "Optical stethoscopy: Image recording with resolution λ/20". Applied Physics Letters. 44 (7): 651. Bibcode:1984ApPhL..44..651P. doi:10.1063/1.94865. ^ Dyba, M. "4Pi-STED-Microscopy..." Max Planck Society, Department of NanoBiophotonics. Retrieved 2017-02-01. "Concepts and Formulas in Microscopy: Resolution" by Michael W. Davidson, Nikon MicroscopyU (website).